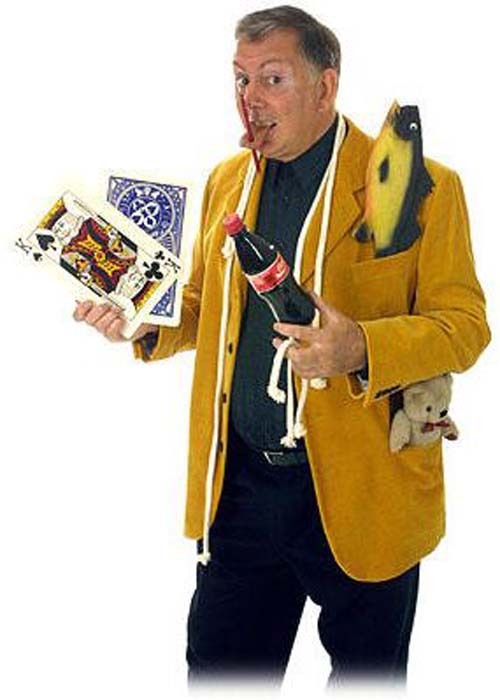 Ron has performed at thousands of company dinners, award events, weddings and trade shows, with his blend of magic and humour. He is often rebooked year after year. Ron is a true entertainer and can captivate a table of 12 people all at once with his table side magic as easily as he can a group of two or three having a drink in a reception. His clients are the best in their fields a fact reflected in their choice of entertainers. They include AOL, Lloyds TSB, Seven Valley Railway, British Airways, 02, Warner Brothers, Peugot, Harrison Holidays, Barclays Bank, Egg, Telewest, The Royal Bank, Euro Gro, MFI, and Time Warner. Often they combine Ron's close-up magic with an after dinner talk or comedy cabaret. When doing cabaret Ron works like a stand up comic who does great magic, rather than a good magician with bad jokes! His style of performance is friendly and relaxed suiting a mixed audience. He blends jokes and observations with visual gags and magic, creating a warmth that his audience enjoy. Many observations are born out of real experiences; which Ron recounts with vivid detail. He has the audience bent double in laughter one minute and then sitting up in amazement in the next.